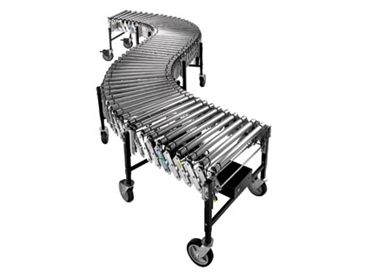 Sitecraft ’s Power/Flex Roller Conveyors are ideally suited for truck loading, distribution centres, packaging, mobile assembly lines, shipping and receiving. The Power/Flex Rollers feature a continuous duty multiple drive motor and adjustable line speed of 0-36m/min. Just plug in and go. The roller conveyors feature: • Zero-pressure Accumulation: Electronic controls enable cartons to move directly to the discharge end without stopping until they reach the last zone of accumulation. • Under Roller Electronic Package Stop: Automatically stops cartons at discharge end of conveyor. When carton is removed, conveyor starts again to bring next carton into position (optional reflective photo cells shown). • Heavy Duty Connectors: Easily connects two or more conveyors to span greater distances.